Turrialba Volcano in Costa Rica registered important eruptions of gases and ashes that have reached up to 800 meters above the crater and 4,140 meters above the sea level (13,579.2 ft.). The first eruption of importance took place at 5:30 a.m. this Thursday morning, and reached 500 meters above the crater, a second and stronger eruption occurred at 8:25 a.m. of 700 meters above the crater and the biggest eruption was registered at 3:23 p.m. The wind is carrying volcanic ash mainly to the west-southwest, and nearby communities register a mild smell of sulphur. 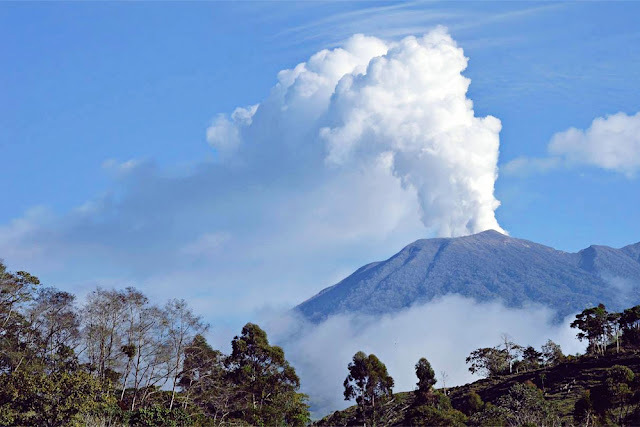 Turrialba Volcano entered an active period in 1990 and since 2010 it has had episodes of explosive activity; currently, the volcano has frequent strombolian eruptions (relatively mildly explosive eruptions) that shoot fragments of hot rock to a distance of as much as 500 meters. According to experts, the volcano will continue with frequent eruptions for a long period until the magmatic body crystallizes and cools off. Access to the volcano is restricted in a radio of 2 kilometres sometimes with an extension to 5 kilometres when required. The spectacle of the active volcano can be appreciated from a safe distance in the surrounding areas.